A truck used for fly-tipping builders’ waste in Acton has been crushed following action by Ealing Council’s envirocrime prevention team. The vehicle, which was seen being used by fly-tippers at Burghley Towers, in Trinity Way, Acton in August, was destroyed at an impound in Watford on Wednesday, 11 November. Council officer Chris Christofis launched an investigation after a member of the public reported the truck had been used by fly-tippers in Acton in August, and the same vehicle was then spotted being used to dump waste again in Watford just days later. 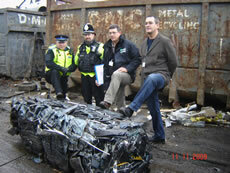 The police were called and three fly-tippers ran from the scene but their abandoned vehicle, still full of waste, was seized, impounded and finally crushed. Cabinet Member for Environment and Street Services, Councillor Sue Emment said: “I’m really pleased that we have helped to take another vehicle off the road that would no doubt be used to dump waste all over London. Unfortunately these cowboys are still out there but that’s one less truck they can use for their dodgy dealings. 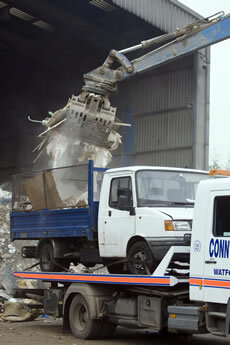 After the truck was seized and crushed, the construction waste was taken to a recycling depot.